Humble Bundle announces its Humble Monthly early unlock for the month of June! It is probably one of its biggest games this year. 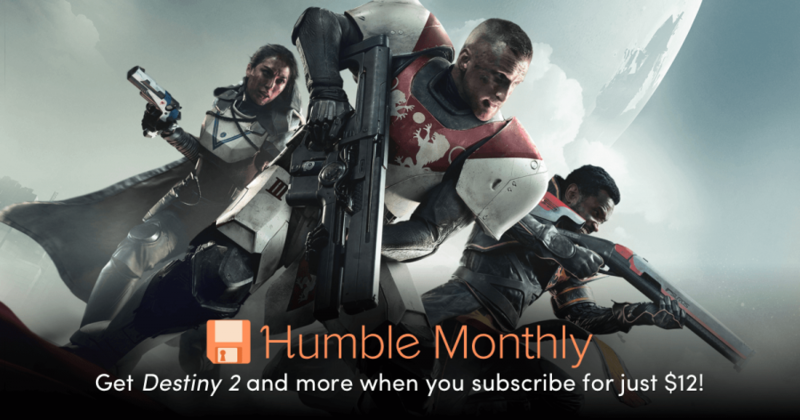 A few days ago, the May Humble Monthly revealed all the games included their bundle. Early unlocks were Kerbal Space Program, Ruiner, and Dead Rising 4. The games that were later revealed were RWR (Running with Rifles), Moon Hunters, Crazy Machine 3, Jalopy, NBA Playgrounds, and a Humble Original, Knight Club. These games have a combined value of $145. For the month of June, Humble Bundle announces that Destiny 2 will be its early unlock. This is considered as one of its biggest early unlocks of the year. You can get the game right away by paying $12, and more to come on June 1 at 10 AM Pacific Time. Destiny 2 is an online FPS game developed by Bungie and published by Activision. Its predecessor was not well-liked by a lot of people, but this game proved that a come back was actually possible. It is also the first game to be released on the PC, as its predecessor was a console exclusive. Last year, the game was nominated and awarded numerous accolades, such the Best PC game, and Best Multiplayer game. Lastly, to celebrate May the 4th few days ago, Star Wars™ X-Wing vs TIE Fighter – Balance of Power Campaigns™, STAR WARS™ Rebellion, and Star Wars™ X-Wing Alliance™ is now accessible to the Humble Trove. All of the games in the Trove are available for those who are subscribed in Humble Monthly.